Milos Raonic is best known for his big serve, but on Monday, he showed everyone he has a big heart, too. Following his opening round, straight-sets win over No. 10 seed David Goffin (6-3, 6-4) at the Rogers Cup in Toronto, Raonic stayed on the court for an emotional ceremony. The ceremony was in memory of Anne-Marie D’Amico, a 30-year-old woman who was killed in the tragic van attack in April. 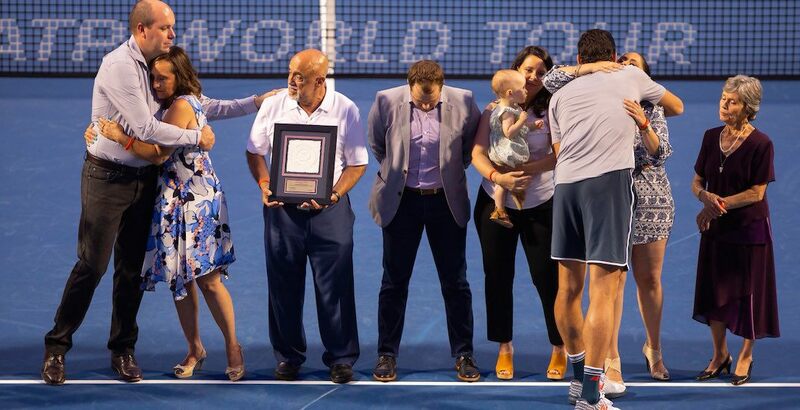 The Canadian tennis star joined members of Anne-Marie’s family on the court. It is a privilege to honour the life and legacy of Anne Marie D’Amico tonight. She will always be part of our Rogers Cup family. Anne-Marie was well connected to Tennis Canada, working at the Rogers Cup since the age of 12. She started out as a ball girl, and was voted Volunteer of the Year in 2016. Most recently she served as a committee head of Stadium Control. Anne-Marie’s mother, father, grandmother, and brother have all been volunteers with Rogers Cup, providing a combined 84 years of service for the event. For his part, Raonic has set up a scholarship program in conjunction with Tennis Canada and New Balance. An annual scholarship of $2,500 will be awarded to a ball kid in both Toronto and Montreal to be used towards higher education.